Monday 29 September; At a press conference held this morning, Dubai’s Department of Tourism and Commerce Marketing (DTCM) and Emirates Airline announced that the 2014 UEFA Champions League 2013/14 winner Real Madrid will face 18-time international titles winner AC Milan in the ‘Dubai Football Challenge’; a friendly match set to take place at The Sevens Stadium in the emirate on Tuesday, 30th December. Topping off what has been a blockbuster year of football, the two Emirates Airline sponsored clubs, will bring their star players to the U.A.E for the thrilling match in front of a crowd of 40,000. 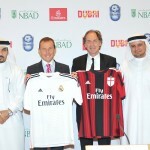 Two of the European club’s legendary ex-players and Ambassadors – Franco Baresi of AC Milan and Emilio Butragueño of Real Madrid – spoke of their respective club’s excitement to be playing in front of their fans in the Middle East. Tickets, which are now on sale at Virgin Megastore and Time Out outlets, cost from AED200 and are expected to sell out in record time. Hamad Mohammed Bin Mejren, Executive Director of Dubai Convention and Events Bureau at DTCM, a coordinating partner of the Dubai Football Challenge, said: “Welcoming footballing giants Real Madrid and AC Milan to Dubai marks a truly magnificent end to what has been a fantastic year for football. Thanks to the World Cup, we have seen the obsession with the beautiful game hit fever pitch amongst locals, expats and visitors alike, so it’s the perfect time to bring this world-class match to the emirate. The match will offer the very best action from two of the top football teams in the world at the home of the Emirates Airline Dubai Rugby Sevens. One of the city’s world-class sporting venues, The Sevens Stadium is well-equipped to serve the 40,000 football enthusiasts expected to descend on 30th December to see the footballing giants in play.